You’d like to straighten your teeth, but you don’t want everyone to know you have braces. Fortunately, there’s a convenient solution for you: Invisalign. At Treasured Smiles Dentistry, our Frankfort, IL dentists are trained and certified in this exciting new treatment. You meet with a dentist at Treasured Smiles Dentistry to discuss your options and decide whether Invisalign is right for you. If you decide to proceed with Invisalign, your dentist evaluates your teeth and creates a personalized treatment plan. The dentist sends treatment instructions to Invisalign. Invisalign uses 3D computer graphics technology to create a series of aligners. Depending on your treatment plan, you may have anywhere between 12 and 48 aligners. You wear your first aligner for about two weeks before switching to the next aligner. Your teeth will gradually move into place until they reach their final position. Invisalign aligners are like clear braces that move your teeth without attracting attention. You wear your aligner at all times during the day, although you can take it out to brush, floss, and eat. Your friends and family members won’t even notice that you’re getting your teeth straightened. In about a year, you’ll have a straight new smile. At Treasured Smiles Adult and Cosmetic Dentistry in Frankfort, IL, we want our patients to feel comfortable. We’re here to support you during every stage of your Invisalign treatment, from your first evaluation to your last. 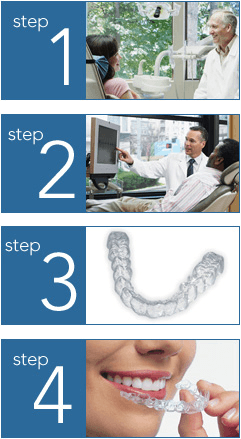 Our dentists can answer all your questions about the Invisalign process to ensure it goes smoothly. Are you ready to achieve a beautiful smile without metal? Find out if Invisalign is the right treatment for you. Call our Frankfort, IL clinic today for an initial evaluation at 815-426-0016. Invisalign Dentist Mokena – Invisalign Dentist New Lenox – Invisalign Dentist Homer Glen – Invisalign Dentist Tinley Park – and neighboring areas.